Does anyone know who Frank Wills is? Hint he died broke in Augusta, Ga. September 27th 2000. Do you have any idea why Watergate developed? We need your advice to survey how many people have awareness about who Mr. Wills was. Bloggers have now become members of the major media community. Note, the hardship he endured were acts of backlash. If you don’t know his story take a look. For those who know, “then you will be the ones that understand how an incident and taking a stand can produced life alerting situation that can control your life for the rest of your life.” I am not going to become Frank Wills. Personal attacks are daily events in my life. “When you are fighting a battle for American Justice you will be subject to personal attacks.” America is an idea, that is why elements were left out by the founding fathers. One great aspect about being an American in the twenty-first century we have laws to help one keep up their ability to fight social battles. While living life in America situations come about that force one to stand up to whatever or whomever. Some time they relate to parenting, employment issues, faith. Life has presented such events and I among others are defending. Convention time is upon us, let the major party members enjoy their gathering for we must comprehend our lives and forge a better future. The Blogger is an avenue of protest, education, and hope as all media. Now that the people have spoken, and we have elected to elect our president for another term, lets work towards a better America. Thanks for stopping by and continued good luck. 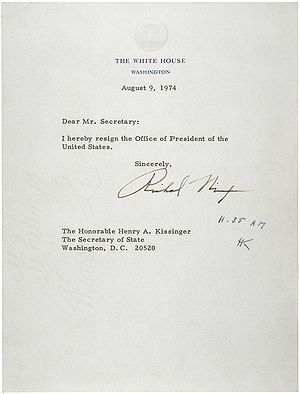 English: President of the United States Richard M. Nixon’s Resignation Letter, 08/09/1974 (August 9th 1974) (ARC Identifier: 302035). (Photo credit: Wikipedia)hange cannot happen without you. I look forward to your comments and thank you for stopping by. I read about Mr. Wills. His is truly a sad story. I fear he was one on those who sought wealth and fame, but couldn’t handle it after getting it. Blaming his failure on his color is nothing more than a cheap excuse to be lazy, or to bully others into changing their minds due to fear of reprisals. The brain tumor may have caused more of his problems than he was aware of. Unfortunately, a number of brain tumors go unnoticed and undiagnosed until it’s too late.